1. I got a fantastic job. It’s creative, it’s challenging, it’s organized, it’s a small office with cool people and there’s even a beer nerd among us. It’s pretty much the best job aside from the irritating commute a whole three or four miles west that manages to take about 45 minutes on a good day (city living for you). Still, the good far outweighs the bad and it’s the first time I’ve been happy in my work since the brief window of early 2013 before I realized I was working for a horrible, abusive narcissist clothed in a generous person’s designer jacket. 2. I was proposed to, and I accepted. I am getting married in June and even typing that sentence, no matter how many times I do it, still somehow feels quite foreign. It’s not that I am one of those people who thought they’d never marry, I guess I just never thought about the possibility much at all. Perhaps it’s because I was dating the entirely wrong guys, but it wasn’t anything I put stock into with regards to my personal future. Now though, well, it’s very happening and it’s freaking awesome. But there’s a problem. A big one. No, it’s not the caterer or the dress or the bridesmaids or a mother in law (who is excellent, btw). It’s this: I have to choose beer to serve at our reception. I know, I know. We’re having it in a raw space where we hire out/bring in everything. Our caterer isn’t handling drinks for us aside from supplying the bartender (Illinois state law prohibits anyone unlicensed from doing it, whatever that means) so we have to do that ourselves. We’ve decided on one red (Pinot Noir? Cab Sav? sure) one white (Sav Blanc, Pinot Gris? whatever), one bubbles, a bottle of Malort because we’re in Chicago, a bottle of mead for the wedding party, and beer. Beer… three kinds of beer. Now here we have the serious quandary. We went from Schlitz to High Life to Coors Banquet (which really is pretty good) and that’s about as far as I got. I say “I” because between us, I am the beer nerd and he knows it. Personally, I freaking love Ale Syndicate’s Sunday Session. It’s light, unfiltered, smooth, just…heavenly. It’s only slightly hoppy but very drinkable and low in alcohol (open bar, folks). It’s a no-brainer and it WILL be featured, hell or high water. But then we have the third beer. Now, I am the only person I know who drinks dark beers year round. I will also admit that black IPAs probably freak a lot of folks out – much like the bartender I spoke to last weekend who wrote off Stone’s Master of Disguise Imperial Golden Stout (WHAT?! I know, I know. You have to try it) because he, “couldn’t get [his] head around it”. What? Dude, your job is to think critically. That stuff is bananas and you’re wrong for walking away from it. I think most people feel that way about black ales, actually. Anyway, that leaves a lot open. I took it to my fellow beer nerds and many suggested Half Acre Daisy Cutter (last time I tried it, I gave it a meh) or Revolution’s Anti-Hero. Everyone loves hops. Everyone but me. Temperance, you need to bottle. If you did, there would be no other brewery there because everything you do is just fantastic. Alas. Sunday Session is unfiltered so I don’t want a wheat. I personally don’t love reds or ambers and while the future Mr. likes pilsners, I am not into them. Now, I grant you, I probably won’t be drinking beer that day so I should not put too much stock in it, but the fact is that most everyone knows that I am the beer dork between us and that puts a certain pressure on me to rep. Rye IPA? Ok, that’s interesting. Stout? No Guinness. Porter? No one is going to want a delicious, thick porter on a June day (stupids), no sours, no lambics, and while interesting, probably no ciders. Well, maybe a few ciders but not enough to make up 30% of the beer list since people rarely drink more than a few in a session. I have no idea what to provide. All we agreed on was to try to keep it local if possible and nothing too hoppy. So, my girl beer group is going to pitch in next month or the month after when we do a BYO and everyone brings at least one offering that gets their vote (while following the parameters above, regarding what we already have). I promise you, I have already spent more time on this post and in this conversation than I have about my dress, bridesmaids, colors, or the groom. This is serious business and I have no idea what to do. Suggestions? Leave them here. I can use them and I’ll add them to our BYO. Help. Me. You’ve had those spring moments, I’m sure. The first crack of the bat, the first time the air smells like humid warmth, the first ray of sunshine that makes you want to stand in it rather than hurry through it because it’s accompanied by a 4 degree wind chill, the mere glimpse of the first buds, a red red-a-robin-a-bop bop boppin’ along your front walk. Or, in this case, the first whiff of Dogfish Head’s “Namaste”. Just a hint of June, right on the nose. A Belgium in a larger format, you ask? Won’t you be on your ear by the bottom? No, I say. You’re not that lucky, sir. At only 5% in 22oz ($5.99), it can’t do much damage unless you’re a lightweight who hasn’t eaten all day. And you know what? That’s ok because it’s so tasty that it would be a shame to get schnockered on a lovely warm weather beverage such as this. Speaking of Belgium and its fantastic selection of adult beverages, it’s actually a pretty fascinating endeavor that these generations of monks support themselves solely on the production of beers which happen to be pretty amazing. I mean think about it, how often do you associate the neighborhood church with excellent pastries when they have a bake sale? Not bloody likely. This is an interesting block of information about the standards and practices of the whole shebang, even though it’s Wiki I know it’s accurate. Also worth checking out are Belgium IPAs. Spicy, citric, just a little buttery. Delightful! And if you’re ever in Chicago, look up Haymarket Brewery and see if they have Angry Birds Belgian Rye IPA tapped because I can promise you that it’s a specimen of the sort and you will not be sorry. 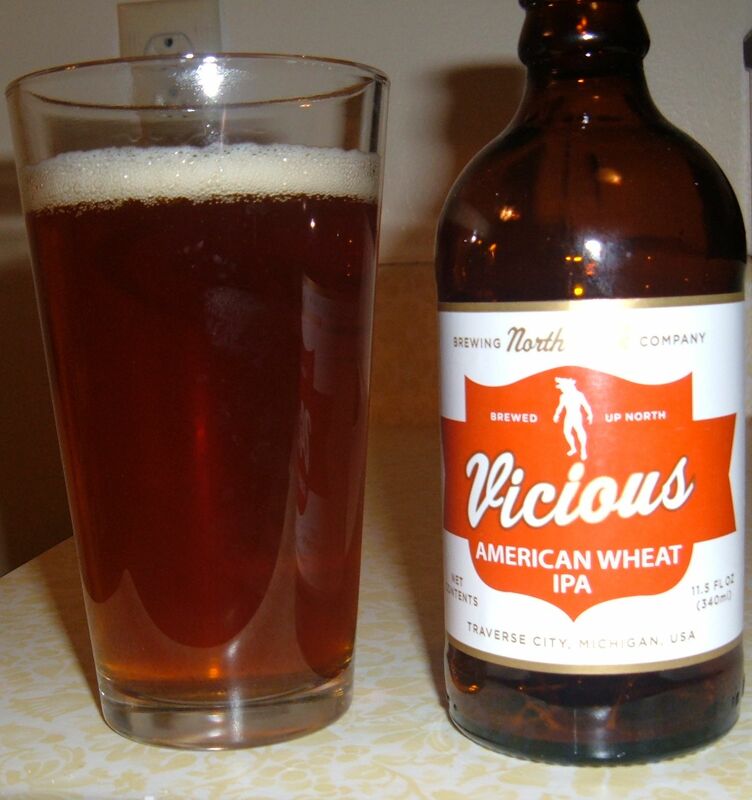 Today, ladies and gents, we have North Peak’s “Vicious” American Wheat IPA, for your pleasure. Not light in color as you’d expect from a wheat and not cloudy either. The color actually, is a deep carmel almost Bass-esque ale hue. Lovely, actually. Very minimal head. At first sip I encountered something I’ve only experienced with a few other IPAs and only in breweries: saltiness. The first time that happened, it occurred next to the man who brewed the beer so I was able to ask him the cause. He said something about sulfur though in my research for this post I can’t seem to find anything about that. Rather, the cause seems to have something to do with a few possibilities: either I am very sensitive to salt (and I am) or the water they use to brew has a higher sodium content than average and mixes with the naturally-occurring salts in the process. It fades as I sip, but the initial impact was surprising. It may be my first wheat IPA so I keep trying to locate the wheat characteristics but am not sure what to look for, I feel it more accurately borders on a scotch ale if not a proper piney IPA. It does have the citrus, earthy element in step with an above average IPA but it’s not blowing me away. In truth, I picked this beer tonight because the other three I have in reserve are stouts which I don’t feel would go quite as well with the pork tenderloin I’m about to tuck into as soon as it’s finished resting. That said, all beer goes well with pork. Actually everything goes well with pork except for like, death. In which case, I’ll have yours. Ok the pork is rested, the pasta is made and the beer is still cold. At this juncture let me just say that the IPA was the best call because it’s one very spicy rub and any other flavor would have both fought with and marred it (both the beer and the pork). I suppose this entry is reflecting how I feel about the beer. Not very interesting (to me), great with a food pairing and most likely not a repeater. Perhaps on a patio in the sunshine it may be a better hit, but there’s not enough going on here to told my interest.